The new G.Loomis rods that we first broke the news on back on March 25th (“G.Loomis Will Introduce New Super-Light Rods This Summer“) made quite a splash at this week’s iCast show in Las Vegas, winning “Best of Show” and “Best New Freshwater Rod” awards. WOODLAND, Washington USA – Available August 13, 2010 – Anglers around the globe realize G.Loomis is a long-time leader in graphite rod blank technology. It started with IM6 and GL2, then to GL3 and IMX, and then GLX more than 16 years ago, the only graphite made strictly for use in the construction of fishing rods. The next breakthrough is now here with G.Loomis’ new NRX fly rod series, offered in 16 four-piece models in weights and designs for trout, salmon/steelhead, saltwater and two-hand/spey techniques. The rods have already received international recognition by being honored with the ‘Best New Fly Rod’ award at European Fishing Tackle Trade Expo (EFTTEX), held this past June in Valencia, Spain, while at the 2010 ICAST Show’s New Product Showcase competition, produced by the American Sportfishing Association, the NRX rods were honored with both the ‘Best New Freshwater Rod’ and overall ‘Best of Show’ awards. Within the NRX series, trout anglers are addressed with four 9-foot rods offered in 3, 4, 5 and 6 weights. 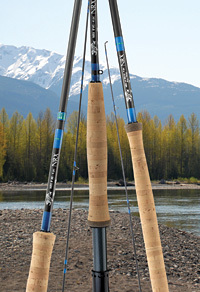 For salmon and steelhead action, G.Loomis offers 10-foot NRX rods in 7, 8 and 9 weights. For both lighter action inshore and heavier tarpon and tuna use in the salt, NRX rods include 9-foot 7, 8, 9, 10, 11 and 12 weight models, while two-hand casters are provide with NRX spey rods in a 13-foot 8/9, a 14-foot 9/10, and a 15-foot 10/11. All the NRX fly rods feature black Ion coated REC Recoil guides. Each rods custom reel seat – proprietary to G.Loomis – has no exposed threads so as to make it easy to lock the reel to the reel seat. The grips feature G.Loomis’ ‘HD cork’ design, where the cork transitions to provide more sensitivity where needed, and more durability in where needed. As with all G.Loomis rods, the NRX models are manufactured in the USA. For more information on the new NRX fly rods (and bass rods), visit gloomis.com, call 800/GLoomis, or stop by your nearest G.Loomis tackle dealer.